(From left) Ling Ching, Lee Han and Wei Li standing proud with deputy principal Leong Kong Jie in their school. MIRI: Three young shuttlers did their school and Miri proud at the recent Sarawak Under-18 & Under-21 Badminton Championships held in Kuching from June 30 to July 2. Wong Ling Ching, Kam Wei Li and Lee Han from Riam Road Secondary School (RRSS) took home one gold, one silver and two bronze medals in the state-level tournament held at the Sarawak Badminton Association (SBA) Hall. Wong Ling Ching won the Girls U18 singles title after beating Kashley Kho of SBA in straight sets in the final. Kam Wei Li got her first medal when she paired with another Miri player Kristy Kho to finish runners-up to Felicia Fong and Flora Fong in the Girls U18 doubles. The first bronze for Lee Han came in the Boys U18 singles. He later combined with Wei Li in the U-18 mixed doubles and the pair snatched another bronze medal. 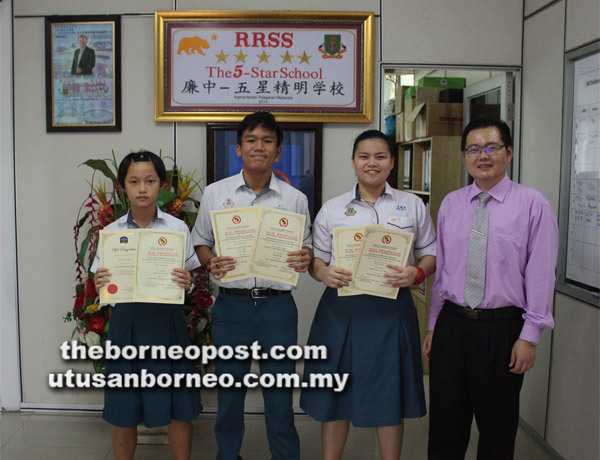 RRSS CEO Dato Dr Fong Onn Min congratulated the shuttlers for their achievements. He said it “wasn’t easy” to face the competition at the state-level tournament and “even more challenging” to be able to win medals. He hoped the three are encouraged by their results to strive even harder in the future.